Submitted by Angarrack.info ... on Tue, 28/01/2014 - 14:14. Submitted by West Historic E... on Thu, 06/02/2014 - 01:00. Thank you for consulting Historic Environment Advice (Archaeology) on the above application. We have consulted the Cornwall and Scilly Historic Environment Record (HER) and the application documents. We welcome the inclusion of the archaeological desk based assessment undertaken by CGMS. The HER records that a railway inclined plane bisects the site and it records the following for this historic asset: The Angarrack Incline ' The Hayle Railway of 1837 gained height from Hayle eastwards by means of an inclined plane. This ran from near the Penmere Hotel in Copperhouse eastwards to Angarrack Station at SW 5875 3855. A stationary steam engine situated at the upper end was used to pull wagons and carriages up the incline. The site of this is called 'Engine Pool' on the tithe award. The enclosure which contained the engine is extant. We welcome the proposed retention of the railway inclined plane; however we would recommend that the proposed pool which crosses the line of the railway is relocated so that it does not conflict with the line of this historic feature. I hope this is of assistance, please do contact me if anything is unclear or further discussion is required. Submitted by Principal Publi... on Tue, 18/03/2014 - 01:00. Landscape designations: The site is not covered by any landscape designation but is within the setting of AONB which lies 4km to the north. It should also be viewed as the landscape setting for Grade II listed railway viaduct. Consult HES. Landscape character: Landscape character impacts were scoped out of the ES based on the case planning officers scoping opinion. However this actually states that heritage and landscape impacts would be addressed by separate HIA and the Design and access statement. It should be noted that the landscape advice officers were not consulted. The Design and access statement does not adequately assess or address landscape character impacts nor does it follow established national guidance. The site is within CA05 St Ives Bay close to and over looked by Angarrack and CA06 Mounts Bay East. St Ives Bay character area is a landscape with extensive beaches and dune systems as well as an historic port and estuary well known for its waders and sea birds somewhat marred by urban sprawl with 'a general impression of the inexorable spread of built development into the rural landscape, with a loss of rural landscape character as at Lelant Saltings, Carbis Bay and the outskirts of Hayle.' The vision objective is 'to bring life back to the port whilst conserving the dunes and estuary' The key planning guidance of relevance is to 'Conserve estuary in relation to overall integrity, habitats and landscape character.' This could include the immediate flood plain such as the Marsh land area. The Mounts Bay East character area is on the whole a tranquil landscape which 'stretches across the mid part of West Cornwall and has a high visual quality especially along the coast. Inland there are extensive mining relicts set in an agricultural landscape.' Whose vision objective is 'to maintain and enhance the visual qualities of the landscape whilst integrating the expansion of Settlement'. Key planning and management guidance is to 'develop design guidance for building in the countryside and integrating the edges of settlements into the surrounding landscape' and to 'Support the Environment Agency in the management of the river systems.' It is questionable whether the remaining wetland landscape buffer is spatially sufficient to function as a development break between this commercial/industrial edge of Hayle and Angarrick. In terms of an urban design overview with regard to urban form and character, the expansion of Hayle towards Angarrick is questionable as it contributes to a linear settlement form which stretches from Water lane in the southwest to Loggans Moor Junction and compounds the drift of the commercial sector to Loggans Moor while there is at the same time development going ahead to the South Quay area which is closer to the historic commercial heart of the town. The land East of Marsh Lane currently is read as a clear open landscape buffer between Hayle and Angarrick which the proposal will undoubtedly erode this spatially and in terms of landscape function and character. Adverse visual impact 'proposed features. Approximately a third of the proposed built portion land is shown on the Councils intranet mapping resource as EA functional flood plain 3b therefore for development to be consented I suggest that it may be beneficial to take recent emerging data into account which suggests that storm precipitation and flood events may increase in severity for the UK and to consider whether these need to be factored in. Consult County Hydrologist Dave Watkins. Planting plan: The planting proposed seems rather generic. Planting which is natural or naturalistic should be typical to the local area and be locally distinctive in preference. I would recommend road side urban areas as shown but the car park planting and any associated with swales and edges of the CWS to be strictly local native. To this end Cornus sp should be omitted ' they are not typical for west Cornwall being naturally found only in the Tamar area. Acer Campestre in native of north-eastern Cornwall and generally rare elsewhere. Suggest using Crateagus mongyna sup. Nordica. Malus and Pyrus are naturally rare so proposed distribution should reflect this. Salix cinerea oleifolia should be included. Note it must be the form oleifolia and NOT Salix Cinerea. Pinus sylvestris is common though introduced however it may be better to use Pinus nigra or maritima considering its closeness to the estuary and maritime influences. The proposed ditch swale and woodland herbage should be specifically approved by the CWT and should be native and typical for Cornish version of the habitats to be created. Can you confirm that this is the case? The decision to respect the local landscape context of wetland in the revised landscape statement following CDRP is welcome. However the use of plant containers requiring an ongoing high level of support e.g. watering is questionable (= not sustainable) in terms of cost and management liabilities. Who will maintain, bearing in mind, highway safety considerations? Ecology: It is noted that the CWT has been closely involved and that they have agreed proposal in principle and for adoption on completion and that Angarrick fields being incorporated go in part to mitigate the loss of the development footprint land. While the proposal appears to provide positive impacts; further species surveys were recommended as yet not submitted- breeding birds and over wintering birds. The application should not be determined until these have been carried out and assessed. The reason is there may be Red List species which may need different habitat or management than is proposed thus impacting the landscape. Lighting may also be an issue so close to the wetland as mentioned in recommendations page 10. I would suggest that the staff car park indicated as east of the main stores block delivery and service yards be more integrated in to the built development and the vegetation separation buffer between the built development and the 'buffer' be stronger. The proposed use of earth bund as a screening feature is not supported. An earth bund will not sit well within this local character and will in fact draw attention by virtue of being uncharacteristic. The Extended Phase 1 survey recommendations with regard to green roof or green wall provision (item 6, page 9) do not appear to have been taken on board. I agree that overall 'residual impact could be positive' but only if recommendations are followed. Flood prevention: The incorporation of SUDs design features mentioned in ES Chapter 8 Flooding and Drainage is welcome. While its functionality should be the main driver it is recommended that they also be aesthetic and ecologically sound. Submitted by Devon & Cornwal... on Fri, 14/02/2014 - 01:00. Thank you on behalf of Devon and Cornwall Police for the opportunity to comment on this application. In terms of crime pattern analysis there have been 331 reported crimes for an area of 1mile radius around the site in the last year. By main crime type these are Burglary 31, Motor vehicle offences 14, Criminal damage/Arson 60, Public Order Offences/Weapons 21, Violent crime 77, Shoplifting 61, Other theft offences 47, Drugs 16, Robbery 1, Other crime 3. In the same time period there have been 223 reports recorded of Anti social behaviour With regards to this I would like to make the following comments for your consideration based on the principles of Secured By Design (See www.securedbydesign.com) The principles have been proven to achieve a reduction of crime risk by up to 75%, by combining minimum standards of physical security and well-tested principles of natural surveillance and defensible space. The proposed layout should offer good natural surveillance over most areas of the site when the stores are open. The retail nature of the site will unquestionably bring a certain level of crime most obviously theft/shoplifting. However perhaps the primary concern from a designing out crime perspective is to try and ensure the site when not open does not become a magnet for those with criminal intentions or likely to cause anti social behaviour. It is perhaps an unfortunate reality that landscaping intended to enhance the legitimate visitor experience may also attract those less welcome out of hours. That is why a robust security and management plan is essential. 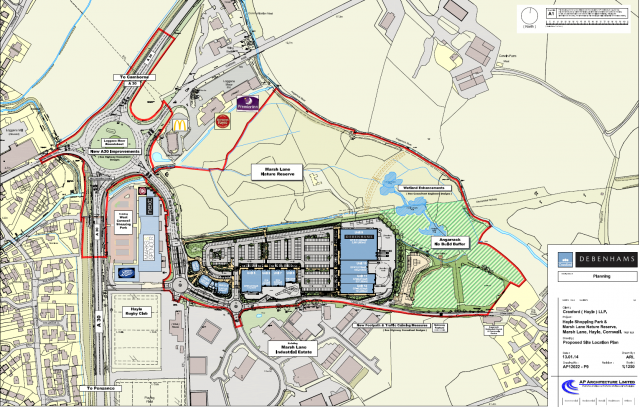 Ideally given the size of this development and the existing phase 1 it certainly would appear feasible to have some form of permanent 24 hours security presence on site to cover both. There must be adequate lighting for external areas advised to be as per BS5489 guidance. This should include all footpath links. I do note the comment within the DAS that CCTV would be considered as part of detail final design. I feel that a proposal of this size must have a monitored cctv capability. I would expect that all external areas be covered by CCTV to help prevent and detect crime and disorder. Hopefully as stated this will be part of any future detailed design but if not then i would ask that it is considered as a condition of any future planning permission. It would certainly appear logical to design and implement a site wide CCTV plan rather than leave it for future tenants to sort out as they see fit. This can often lead to relatively poor overall coverage and actually more cameras in use than is really necessary. Clearly any site wide system will require proper and effective management. Additional measures throughout the car park to discourage misuse by 'boy racers' such as speed humps should be considered. I note and welcome the inclusion of the vehicle barrier. I also note the intended use of bollards or similar to protect store fronts from possible vehicle attack. I would advise that all glazing at ground level comprise at least one pane of laminated glass. Where possible all external doors and windows should be tested and certificated to a recognised security standard such as LPS1175 or possibly PAS 24:2012. Due to potential arson risk external doors are not advised to incorporate letterboxes unless there is a suitably approved fire retardant receptacle affixed inside. Units when built should be protected by monitored alarm systems the necessary trunking should be installed to enable this. External storage bins must be secure and not easily moveable again in case of arson or general misuse. Again i note that soft landscaping will not be allowed to unduly interfere with lighting or surveillance be this natural or cctv. A clear protocol to ensure this must be established. Within the hard landscaping thought must be given so as not to unwittingly create a potentially attractive playground for skateboarders. This has unfortunately happened at other retail/industrial parks and is then subsequently very difficult to deal with. Whilst appreciating that only A3/A4 uses are presently sought for the units 1-4? i feel it should be noted that Police would be unlikely to support any future A5 usage from such venues. Police experience of similar arrangements elsewhere is that these have often resulted in significant issues of crime and particularly anti social behaviour within shared use car parks and subsequent difficulties encountered in relation to the management of these. Submitted by South West Wate... on Wed, 29/01/2014 - 01:00. I refer to the above application and would advise that whilst South West Water have no objections in terms of being able to service the development a public sewer as shown on the attached plan runs through the site. No building/structures or alterations to ground cover will be permitted within 3 metres of this sewer and should the development be unable to meet this requirement we will need to divert this at the full cost of the developer. Submitted by Cornwall Wildli... on Mon, 24/03/2014 - 01:00. Thank you for consulting Cornwall Wildlife Trust on the above planning application. This site lies within a County Wildlife Site and would result in a permanent loss of almost 25% of that site. We feel that, in line with section 118 of the National Planning Policy Framework, alternative sites should be considered in preference to this site. We are aware of at least one such site available locally that is not County Wildlife Site and lies completely outside the flood zone. For this, and other reasons detailed below, we object to this application. The NPPF is very clear in section 118 that local planning authorities should refuse planning permission if 'significant harm from a development cannot be avoided (through locating on an alternative site with less harmful impacts), adequately mitigated, or, as a last resort, compensated for'. At the top of this mitigation hierarchy is locating on an alternative site. At least one alternative site is available locally with a retail developer interested. The Local Planning Authority may know of more alternatives. 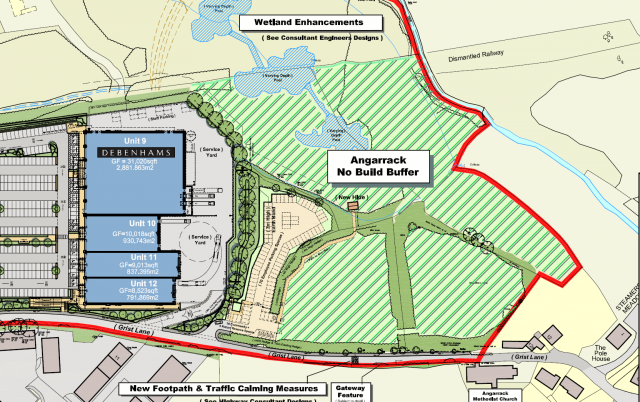 We feel that this development should be sited in an alternative location since it would lead to a loss of 25% of the Marsh Lane County Wildlife Site. The ecological report includes a small section on alternatives: 'Whilst the site is what it is and where it is, options and preferred design criteria have been borne in mind throughout the EIA process'. We do not feel this adequately addresses the issue of alternative sites. Whilst we feel an alternative site should be chosen, and that this is enough in itself for Cornwall Council to refuse planning permission, we have given additional reasons for objection below. Some survey information is incomplete including: wintering birds, breeding birds, invertebrates, bats and reptiles. Biodiversity is a material consideration in planning decisions and all information is required at the planning application submission stage. Survey results feed into the Impact Assessment and proposals for mitigation, compensation and enhancement. A planning application should not be determined until all the relevant information is available. Results from these unfinished surveys may show the site is more important than the current planning submission suggests. The Ecological report repeatedly refers to the fact that 'none of the species [of bird] recorded has any special conservation significance'. However, the full survey results are not yet available and preliminary results included records of water rail and woodcock, both of which are amber listed. We saw no reference to previous bat activity surveys, or any additional bat survey. We feel the issue of lighting on bats needs to be informed by bat activity surveys and a lighting plan submitted with this application. The Ecological chapter of the Impact Assessment is entirely based on the author's presumption that the ecological compensation suggested as part of the development outweighs the likely harm that would result. We could see no quantitative data within the application to support this assumption. Without quantitative information on the habitats to be lost, gained and enhanced it is not possible to see if the compensation suggested does outweigh the harm. The Ecological survey states that 'The trend to wet woodland is already clear and rapidly advancing'. There is no evidence given to substantiate this claim, such as aerial photo information. It is important to prove whether or not this is happening and at what rate. A large area of the development footprint area is classified as 'tall ruderal' and written off as being low value. We know from recent site visits and our own previous surveys of this site that marshy grassland plants re-colonise after site clearance. Twice in recent years the site has been cleared by excavators, but the wetland plants have persisted. We request that a more detailed botanical survey be carried out that will better reflect the transitional nature of the habitat as the site recovers from previous damage. This more detailed information will be useful in correctly assessing the likely harm that the proposals would cause. Several references are made in the Ecological report to the habitats the County Wildlife Site (CWS) was designated for and the fact that these will not be impacted by the development. We feel this undermines the importance of the CWS as a whole. The County Wildlife Site Criteria for Cornwall, prepared in partnership with Cornwall Council, include detailed procedures for delineating sites. These include points about the importance of mosaics, including habitats that would fail to meet site selection criteria on their own, but that are important as part of a mosaic, and as a buffer for other habitats. For example, on page 9, section E of the criteria it states that 'the site as a whole may clearly be large and diverse and value is added by the fact that the juxtaposition of the different habitats and the transitions between them are an interesting feature in themselves. Generally, the greater the number of additional habitats, the greater the overall importance of the area as a whole'. We do not agree with the assertion that because the priority habitats are not directly affected the proposals are not damaging to the wider biodiversity interest of the site. The Ecological report states that the application will be able 'to deliver significant positive ecological impacts' but no quantitative information is provided to back up this claim. More detail is required on how much compensation is planned before we can judge if this will be significant and positive as stated. The report also states in section 7.5.6 that the area to be lost has 'low biodiversity value in its current state' but several surveys have yet to be submitted, so we feel this conclusion may be premature. It would be more transparent if the CWS development footprint area is shown separately to the non-developed footprint and retained fields. Also, it is not clear how the 'positive impact' is broken down into mitigation, compensation or enhancement, which makes it difficult to assess the overall impact and how it relates to the mitigation hierarchy. Splitting off 'CWS designated habitats' is misleading as it ignores the habitat mosaic and buffering issues mentioned above. It also ignores surveys of species groups that have not yet been completed. The section on macroinvertrates and birds is very incomplete as surveys have not been submitted yet. The management plan includes little quantitative information on the planned compensation work. It is also unclear in what is suggested as compensation and what is planned enhancement over-and-above mitigation and compensation. Some proposals for enhancement like pond creation, may impact on existing habitats. We would like to see more information on any habitats that will be lost to create new habitats as this needs to be taken into account when trying to quantify the impact of the application as a whole. Submitted by Environment Age... on Thu, 27/03/2014 - 01:00.
i) it will result in the net loss of approximately 24% of the Marsh Lane Meadows County Wildlife Site (CWS). ii) no evidence has been submitted to demonstrate that the flood risk sequential test has been applied. We recommend that the application should not be determined until this has been undertaken. iii) there is insufficient information to demonstrate that the risk of pollution to controlled waters is acceptable. The National Planning Policy Framework (NPPF) paragraph 109 recognises that the planning system should aim to conserve and enhance the natural and local environment by minimising impacts on biodiversity and providing net gains in biodiversity where possible. Paragraph 118 of the NPPF states that; if significant harm resulting from a development cannot be avoided (through locating on an alternative site with less harmful impacts), adequately mitigated, or, as a last resort, compensated for, then planning permission should be refused. Parts of the application site lie within Flood Zone 3 and 2; defined by the Environment Agency Flood Map as having a high and medium probability of flooding. The flood risk Sequential Test set out in the NPPF should therefore be applied. Paragraph 101 of the NPPF requires decision-makers to steer new development to areas at the lowest probability of flooding by applying the flood risk sequential test. In this instance no evidence has been provided to indicate that this test has been carried out. Failure of the sequential test is sufficient reason for refusal of the application. The NPPF paragraph 109 states that the planning system should contribute to and enhance the natural and local environment by preventing both new and existing development from contributing to or being put at unacceptable risk from, or being adversely affected by unacceptable levels of water pollution. It is apparent that an alternative site is available on the neighbouring Rugby Club site that could accommodate the built proposal. However, the consideration of alternatives and the retail sequential assessment excludes the Rugby Club site. This alternative location would be preferential because it would not result in a net loss of wetland and is situated in Flood Zone 1, which is at lower risk of flooding than the application site. We consider the biodiversity value of the site has been underestimated. For example, paragraph 7.5.11 states that the areas of CWS are of low ecological value but there is no detailed information to support this. There are several ditches across the site, which are likely to provide passage for eels (and a range of amphibians and reptiles). The application has not considered the potential effect on trout and eel passage at the site. We also note that some ecological surveys are incomplete. With regard to wider biodiversity and protected species there is no consideration of species such as the commoner amphibians some of which are UK BAP species, bats and reptiles. We note the recent submission of the overwintering bird survey. In the absence of these completed surveys the Ecological Report's evaluation is incomplete. As highlighted above an alternative site is available that should be considered. If your Authority considers this is not an alternative then we advise that the application does not quantify how the compensation scheme fully compensates for the net loss of wetland. A simple biodiversity balance sheet for what has already been lost, what will be lost to the built development and what will be created to compensate for the loss should be submitted. However, as highlighted above the incomplete surveys mean that the biodiversity value of the site is underestimated. It therefore makes it difficult to determine if the compensation is adequate. There is a licensed abstraction (15/49/251/S/033) situated at National Grid Reference SW579385 that may be at risk from the development proposals, including from the operational phase. An assessment of risk to this and other identified receptors is required prior to determination of the application. We have previously sighted the Preliminary Geo- Environmental and Geotechnical Assessment. Tweedie Evans Consulting Limited report 0902003.001.01 dated April 2009 which was submitted for the last planning application at this site. The information provided in this report provides a measure of reassurance that the development site is not likely to be significantly contaminated. However, the report does not specifically include a controlled waters risk assessment and therefore does not provide any information on the likely risks to the licensed (and potentially unlicensed abstractions).